We produce and bottle our handcrafted, award winning wines in small batches right here in our production facility adjacent the tasting room. Blanc Céleste is a light and refreshing, crisp white, featuring tropical fruit and pear highlights with a hint of sweetness, perfect for every occasion and taste. Great cocktail wine, served with appetizers, grilled food, pasta and seafood. Double Gold Medal Winner, 2016 Iowa State Fair. Perry--in the style of champagne--will twinkle on your tongue and scintillate your senses with refreshing, delightful bubbles. Made from our award winning semi-sweet pear wine, featuring fresh and floral, balanced and bright, aromatic and delicate true fruit flavors. Gold Medal Winner 2018 Mid-American Wine Competition. Gold Medal Winner and Best Sparkling Wine, 2017 Mid-American Wine Competition. Grape Expectations—A Classic Concord Wine—Sunny, lively and sweet, fresh-picked fruitiness, satisfies the old-timey grape lover in all of us! Pleasantly smooth and well balanced. Silver Medal Winner 2018 Iowa State Fair. 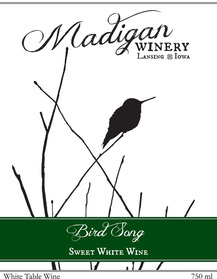 Birdsong is an agreeable well-balanced sweet white, highlighting delightful tropical fruit flavors, and fresh, clean acidity. Red Moon Rising--we've created this year's vintage using a field blend of our Marechal Foch and Petite Pearl. The Petite Pearl adds a garnet-amethyst bloom, soft tannins, and jammy-fruit elements to the subtle dark cherry flavors of the Foch. This dry-red is rich and lush, with creamy mouthfeel and expressive French Oak highlights. Drink now or age for a year or two. Gold, 2018 Finger Lakes International; Gold, 2018 Indy International Wine Competition. Double Gold, 2017 Great American International Wine Competition. 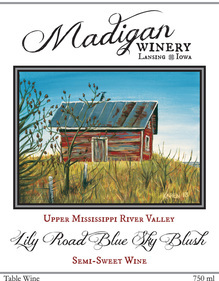 Semi–dry blush wine, featuring luscious, juicy, fruitiness extracted from our estate reds, Foch, Marquette and Petite Pearl with an early and light press, finishing with a refreshingly crisp, clean tartness, from our Elmer Swenson white varietal, La Crosse. Perfect for the pool, porch, patio and pond! Silver Medal Winner, 2018 Indy International Wine Competition. Pear wine is a semi-sweet fruit wine featuring fresh and floral, balanced and bright, aromatic and delicate true-fruit flavor. Silver Medal Winner 2018 Mid-American Wine Competition. 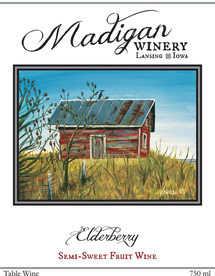 Our 100% elderberry wine is a rich and intense semi-sweet fruit wine featuring a mix of fruity and savory elements. Distinctive. For those whose parents and grandparents made elderberry pie, jam, or syrup, this will bring back familiar memories! Bronze Medal Winner 2016 Iowa State Fair. 2018 Mid-American Wine Competition, Gold Medal Winner--Our Perry, a sparkling pear wine, won in a competition featuring entries from wineries in 18 "mid-american" states. 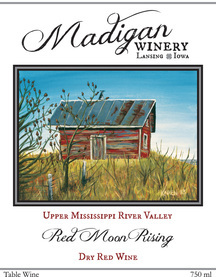 2018 Indy International Wine Competition, Gold Medal Winner--Our Red Moon Rising, estate-grown, dry red won Gold in this year's competition of nearly 2,000 entries from around the globe. 2018 Great American International Wine Competition, Gold Medal Winner--Our Birdsong, sweet white estate-grown blend won Gold in this year's competition of 1400+ entries from 200+ wineries representing 19 countries, 36 US states and 4 Canadian provinces! 2018 Finger Lakes International Wine Competition, Gold Medal Winner--Our Red Moon Rising, estate-grown, dry red won Gold in this year's competition of 3000+ entries from 600+ wineries! 2017 Great American International Wine Competition, Double Gold Medal Winner--Our Red Moon Rising, estate grown dry red, won in a competition of over 1000 wines from 12 countries, judged by 25 judges representing 9 countries over 2 days of competition. 2017 Mid-American Wine Competition, Gold Medal and "Best Sparkling Wine"--Our Perry, a sparkling pear wine, won in a competition featuring entries from wineries in 18 "mid-american" states. 2016 Iowa State Fair, Double Gold Medal Winner--Our Blanc Celeste is 1 of only 6 wines awarded the Double Gold out of 171 entries. "Double Gold" means that each judge awarded the wine, in competition, a "Gold", thus it is unanimously decided, and receives the special designation, "Double Gold". What is the cause of a corked wine? The culprit is usually TCA, which is short for 2, 4, 6 Trichloroanisole. TCA is a type of fungus that occurs naturally--it's a fungi present in the bark of the cork tree, and can be easily be taken into the cork. All it takes is approximately five parts per trillion of TCA in red wine to destroy it. In white wine, it takes even less as it only requires 2 parts per trillion to ruin the wine. To illustrate this, a single drop of pure TCA could inflict its damage on more than 100 massive swimming pools. If a wine is defective due to the cork, the problem took place the moment the cork was inserted into the bottle. At that point, or within a minute or two, the wine became corked. It is that fast. Recognizing corked wines is not always easy. The worst corked bottles smell like a wet dog, mold or old damp, wet newspapers. 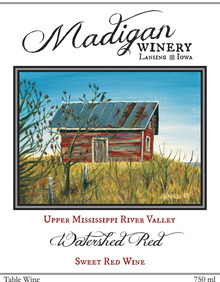 Madigan Winery prefers to use natural cork, and we're aware that, while rare, it is possible that cork taint may exist in any one of our bottles of wine. We purchase our corks from reputable sources to try to avoid this problem. Please accept our apologies if a bottle you purchased from us is corked, and be aware that we stand by our products and are happy to exchange a tainted bottle and cork for a new one.